September 10, 2002 - 6:30 p.m.
A woman smoothly slides past the windows in front of me as if she's on a quickly-moving conveyor belt, but actually she's on rollerblades. Another woman walks rapidly in the opposite direction with a barely-visible wire sending music directly into her brain. A third woman with a cell phone up to her ear walks past her, and behind follows another woman pressing numbers on her phone. 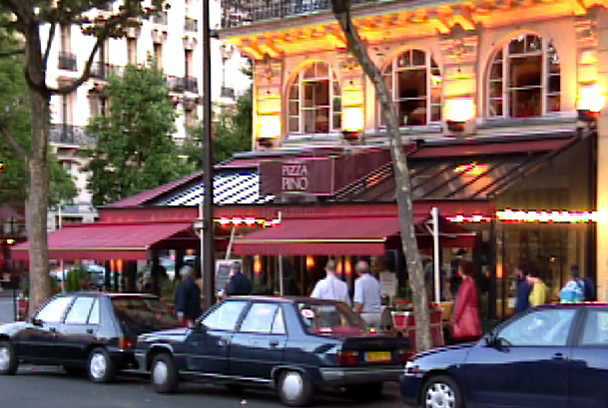 And all around them, before and after, are a variety of men and women engaged in the activity of walking past the front of the Pizza Pino restaurant on the east end of Place de la République. Through the upper, slanted windows I can see most of a large tree with blue sky behind and a few puffy clouds relegated to the bottom right corner. I ate a four-cheese pizza here, because I was hungry and because it was there on the menu. It's sad when eating a pizza makes you wonder why you ever eat pizza. It started out all right and I was doing the knife and fork thing because it's impossible the eat a French pizza with your hands anyway, but after the first two-thirds I was miserable. It was a bad sign when the pizza showed up about three minutes after ordering. It simply is not possible to create and cook (the menu mentioned a wood-burning stove) a pizza in that amount of time without taking shortcuts. It was your typical French pizza in that the crust was too thin to be considered a crust and became soggy cardboard towards the end. Not very appetizing, even with an assortment of cheese spread over the top. The funny thing about French pizza places relates to the fact that French people typically don't like spicy foods. Now in normal pizza places (meaning, in the U.S.), red pepper is available in dried, flakey form to sprinkle on the pizza as desired to enhance the flavor a bit. But dry red pepper is too much for the sensitive French palette, so someone had the bright idea to serve pizza with a bottle of oil containing spicy peppers, the oil thereby acting as an intermediary to weaken the peppers' kick. Unfortunately, pizza in general has more than enough oil and/or grease on it already, and I'm not sure how adding more oil on top could be a good thing, even with the added (diluted) spice effect. I think I can safely say I have never seen a pizza that I've wanted to add more oil to. It's just a bad idea all around. For dessert I got an espresso that came with a sugar-coated walnut half and a tube of powdered sugar. My table is fairly large and round with a light orange flower-embroidered tablecoth and a white corrugated paper table mat on top. The ashtray is simply a little white ceramic soap dish that says "Pizza Pino" between thin green and red stripes and "Restaurant" below that. The bill came on a round silver platter the size of a cd, but with tiered edges as if it were a little silver ampitheater whose only spectacle is a receipt for 12 euros and 50 cents. Needless to say, the audience turnout was nonexistant. There is a large urn near me holding a small tree; the urn's sides are stained red, green, and beige. 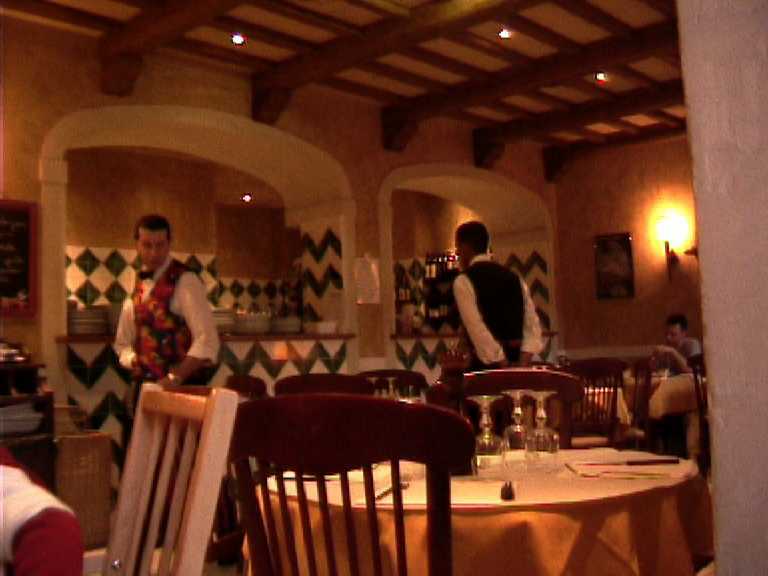 The waiters are wearing vests with multicolored squares on the front that make me feel like I'm at Chuck E. Cheese's. The chairs in the front section are dull green wood and wicker, and in the section behind me they are red wood with upholstered green and gold seat cushions. The waiter comes by and asks me if I would like to order a second espresso. No thanks, I think I've spent too much money here already.